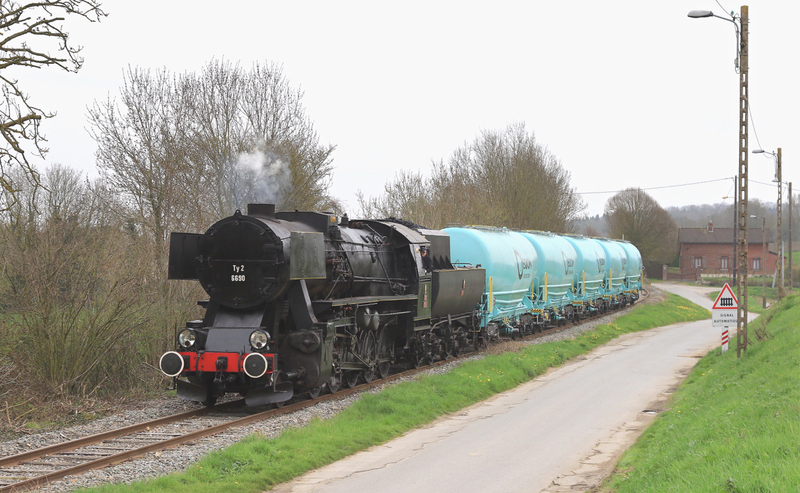 BB 15014 passes slowly through Meulan Hardricourt with a diverted Paris Saint-Lazare - Caen intercité on Easter Monday April 2nd. The photographer with nerves of steel escaped by 2 seconds from having his photo spoiled by an incoming Transilien on the up line ! The intercité was delayed behind an omnibus service. The usual left bank route via Poissy was occupied by engineering work. 15014 entered service in December 1973 and has kept the "Grand Confort" grey livery with red bands and orange lining. On the other hand, the number is in a non-standard position due to the SNCF macaron surviving in the centre. The sector number (1) is missing. Compare with 15035 below. BB 27360 heads a Transilien Line J service with a rake of six modernised VB2N carriages at Meulan Hardricourt, inbound to Paris Saint-Lazare from Mantes-la-Jolie, on March 25th. The journey time will be 56 minutes from the attractive, restored, outer suburban station at Meulan that opened in 1892. Note the use of wrought iron decoration on the building, highlighted by red paint. Plans to reform SNCF trigger wide spread strike action across French rail network. Unions have called a national rail strike for three months starting April 3rd, effective 2 consecutive days every 5 days to oppose the reform of SNCF proposed by the government. 60 - 75% of drivers, 50% of guards and 25% of signalling staff are generally participating in the strike. As an example, on Wed April 18th, the seventh strike day, 60% of drivers were absent compared with 77% on the first strike day, April 3rd. On average, the following trains were operated; 1 in 3 TGV's, 2 in 5 TER and Transilien services, 1 in 4 intercité trains and 3 out of 4 international trains (Eurostar and Thalys were nearly normal, Lyria 1 in 3, no trains to Italy or Spain, 3 out of 5 to Germany). Many rural secondary lines however had no TER trains at all. There is some disruption on non-strike days as well, again particularly on rural lines and some Transilien lines. At the beginning of March, the government announced plans to reform SNCF and invited unions to participate in talks during two months in parallel with the presentation of the reform bill in the Assemblée Nationale. On April 17th, the first reading of the new law was approved and it will be passed to the Upper House (Sénat) at the end of May. - Legal structure The three publicly owned entities (EPICS) will be replaced (Jan 1st, 2020) by a publicly owned Holding Company (SA) with several subsidiaries. The unions allege that this is to facilitate a future privatisation, which the government denies. - Competition. In line with the 4th directive of the EU (2016), passengers trains within France will be opened to competition, starting in Dec 2019 with TER services, followed by TGV services in Dec 2020 (open access). Competition in Ile de France will be delayed. Transilien services excluding the RER lines will be opened gradually to competition from 2023 - 2033. RER lines C, D, E will be opened from 2033 and RER A + B will be opened from 2039. New lines in Ile de France will be opened to competition in 2019 - 2023. - Employment conditions SNCF employees will retain their current status and conditions but new staff recruited from 2020 will be subject to different conditions. New more flexible methods of work have to be negotiated to improve productivity. Staffing issues with the arrival of new operators are addressed. - Debt The government recognises that it must take over some of the nearly 50 billion euros of debt. This debt has historical origins that date back to the 19th century. 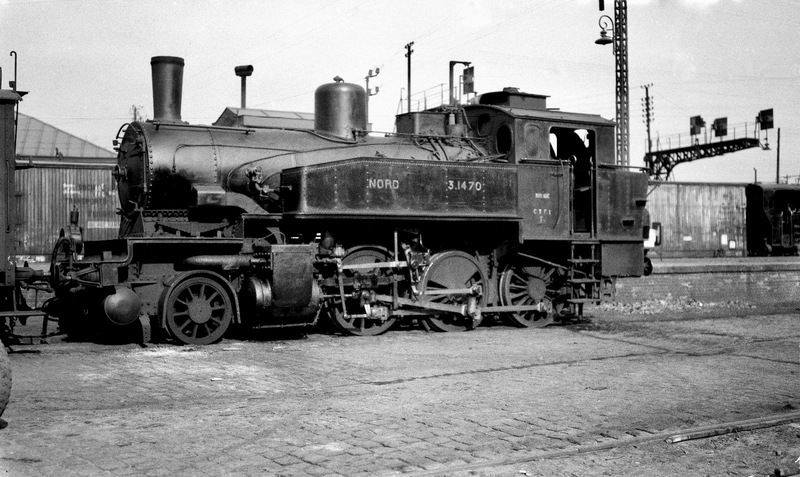 80 years ago the newly created SNCF took over debt from the private companies that were bankrupt. The debt has doubled in the last ten years due to the building of new high speed lines and to overdue investment in renovation of the network that is not fully covered by toll charges. It is impossible to create the new legal structure with a 50 billion euro debt. The government is linking the amount of debt they will take over to progress on the reform. This is rejected by the unions who note that the French State is responsible for creating the debt. - Freight The loss-making freight division, faced with competition since 2006, has created 4.3 billion euros of debt. The government plans to recapitalise the freight operation in a subsidiary of the future new holding company. Unions believe that this is a disguised plan to privatise SNCF rail freight. After the first month, there is no indication of much weakening among those on strike. The unions are strongly opposed to all aspects of the proposed reform and they have presented their own plans without much success. The unions cling to the concept of a monopolistic public service and reject competition. They want to retain their special employment conditions and are reluctant to accept more flexible working practices. They want the State to take over all the debt and reject any kind of bargaining on that. According to SNCF President Guillaume Pepy, each strike day costs 20 million euros to SNCF so a total loss of 240 million euros was recorded in April. But there is also an additional deficit in other industries particularly those which depend on the railways - agriculture, metallurgical and petro-chemical industries, tourism. During April, union representatives met frequently with the Transport minister for what she called negotiations and what they called discussions. In fact, we don't know what resulted from these meetings except that after 3 weeks the unions pulled out demanding to meet the prime minister. A date was agreed; May 7th. During April, the government has made no concessions at all to the rail unions. The Macron government has a huge electoral majority and currently strong support from the population to reform SNCF. This is due in part to the fact that 80% of the population never travels by train and is indifferent to the problems. Those who are obliged to use the rail system are responsive to the increased media attention on operating problems which arise on an ageing rail network. In the past, French governments have always failed to carry through reforms of SNCF faced with stubborn unions and disruption. President Macron was elected with a programme to reform France. He has little time or space for negotiation. It seems likely that his new deal for the railways will be set in motion but it is less clear whether it will result in a better SNCF. Planned strike days for May are: 3rd/4th, 8th/9th, 13th/14th, 18th/19th/ 23rd/24th, 28th/29th. The eight X 72500 diesel railcars in Midi-Pyrénées were withdrawn at the beginning of April after approximately 20 years in service. The 2-car units were 72517 (Dec 1997), 72537/39/75/83/87 (1998) and 72653/57 (all 1999). They were used principally between Toulouse - Figeac - Aurillac and Toulouse - Mazamet. The X 72500 has a streamlined appearance, but when the nose doors are opened to reveal the coupling apparatus, it is less aesthetic and is known as a "vacuum cleaner" ("aspirateur"). Delivery of new Regiolis and Regio 2N train sets provoked the retirement of the X 72500 diesel railcars that have been, generally, unreliable. Midi-Pyrénées now operates 28 Regiolis bi-mode units, Since the beginning of 2018, 1 out of 5 new electric Regiolis units has been received and 4 out of 13 Regio 2N units. With further deliveries of Bombardier Regio 2N and Alstom Coradias in TER Regiolis and Intercité Liner formats the number of hauled passenger services continues to dwindle. Diesel haulage in France is now confined to a number of small pockets. The following gives an overview by area of those services that are expected to be loco-hauled this summer. As further deliveries are made and stock cascaded the position could alter further. More detailed information is available to members of SNCFRailGen and ERG (European Rail Gen) Groups (both IO Groups) where members post observations and latest known locomotive diagrams are available for personal use. Figures quoted generally refer to weekday workings. The Intercité services from Gare du Nord to Maubeuge, Cambrai, St Quentin, Amiens and Boulogne remain loco hauled with BB 22200s. The five return services to Boulogne are operated by BB 67400 diesels north of Amiens. All of these services will transfer to Hauts de France TER in due course and a range of Alstom Coradias and Regio 2Ns are on order to replace the current Corail stock. The Boulogne services are likely to be the first to go, to eliminate the diesels and lengthy locomotive change at Amiens. A small number of push-pull BB 15000s operate outer suburban services from Gare du Nord with duplex stock. New HdF TER Regio 2Ns are making inroads into these workings. In a period of transition, the remaining locomotive hauled services only operate on rush hour services. Four train sets inbound in the early morning to Paris-Est along the Marne valley from St Dizier and Chalons return in the evening on the 16:36, 17:36, 18:36 and 19:36 services with Class BB 15000 and Corail stock. One of the two La Ferte Milon services (probably the 18:05) forms the last diesel hauled service from Paris with a BB 67400 and RIB push-pull stock. On Fridays, Saturdays and Sundays the Intercité Eco service (bookable only online) operates with a BB 15000 making the round trip from Paris to Strasbourg. In the east of the Region the remaining BB 25500s operate around Strasbourg mainly on stopping services between Saverne - Strasbourg - Selestat. Push pull BB 26000s and corail stock operate the TER2000 services between Strasbourg and Bale, with some rush-hour services reaching Nancy. Two or three BB 67400s also appear on rush hour services, normally on the St Die line. All of the long distance Intercité services remain locomotive hauled. Services to Orleans (BB 7200) and Tours (BB 26000) will transfer to Centre VdL TER and 32 Regio 2Ns are on order to follow the Normandie TER units. Bourges/Montlucon services are BB 26000 (occasionally BB 7200) with the two Montlucon services diesel hauled by BB 67300/67400 south of Bourges. It is expected that in 2019, the Montluçon - Paris through service via Bourges with engine change will be replaced by a Montluçon - Vierzon shuttle ( 3 Regiolis on order) and change to a POLT train. The POLT (Paris-Orleans-Limoges-Toulouse) services to Limoges, Brive, Cahors and Toulouse are mainly BB 26000s with some BB 7200s. These are expected to remain locomotive hauled until the high speed Intercité replacement appears. The Intercité services from St Lazare to destinations in Normandy all remain loco-hauled pending the delivery of 40 Bombardier Regio 2Ns from next year when Normandie TER will take over the services. Services to Rouen and Le Havre are operated by BB 15000s (with a high proportion of duplex push pull stock). Services to Cherbourg tend to be BB 26000 with BB 15000 on Caen and Deauville-Trouville services using conventional corail stock. A fleet of 42 BB 27300 operate Transilien services from St Lazare on lines L and J. Seven BB 17000s remain in service and two or three operate most days covering for unavailable BB 27300s, although the actual workings are difficult to predict. Paris Bercy the poor relation to neighbouring Gare de Lyon remains well served by locomotive hauled services. Intercité services operate to Clermont Ferrand (BB 26000) and Nevers (BB 22200). Centre TER is taking over the Nevers services with Regiolis units in a year or so, while the Clermont Ferrand services will need to await the high speed Intercité replacement that is still at the procurement stage. Bourgogne TER operate the semi fast service to Dijon and Lyon with push-pull BB 7200. Having rejected Regio 2Ns for these services they are likely to remain for the next few years. The weekend Intercité Eco from Bercy to Beaune and Lyon ran until March but is no longer mentioned on the website. A handful of BB 22200 remain at Dijon operating on Belfort-Besancon - Dijon/Lyon services with push-pull corail stock, operating alongside AGCs and Regiolis units. 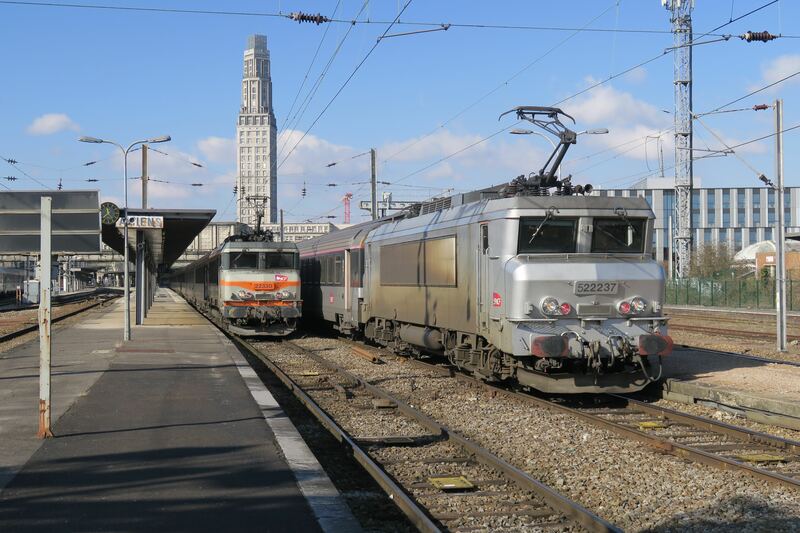 Further south there is a sizable stud of BB 22200 at Chambery working long distance TER services connecting Lyon, Dijon, Chambery, Marseille, Geneva, Grenoble, Bourg St Maurice and Annecy. A handful of BB 7200 remain at Toulouse on TER duties that sees them reach Agen, Brive, Avignon and Cerbere. Marseille operates two small fleets of BB22200. One operates services to Narbonne, Beziers, Nice and Avignon with Corail stock. The other operates the push pull TER stock predominately between Marseille, Avignon Centre and Avignon TGV with some turns to Mirimas. Linking the Mediterranean and Atlantic the Marseille - Toulouse - Bordeaux Intercité services are operated by BB 7200, although BB 22200 also appear. It has been suggested that these services could be taken over by surplus TGV sets. In February we reported that the BB 67300 sub -class was down to three operational locomotives. On 27th April 67348 caught fire near Saint-Florent-sur-Cher while working a Paris - Montlucon service and is unlikely to be repaired. Sunday 27th May is the last scheduled day of service for the Le Treport - Beauvais and the Le Treport - Abbeville lines. While the line to Beauvais will be rebuilt and is expected to re-open in December 2019, no funding has been forthcoming to meet the €40 million required for the Eu - Abbeville section which is expected to close. 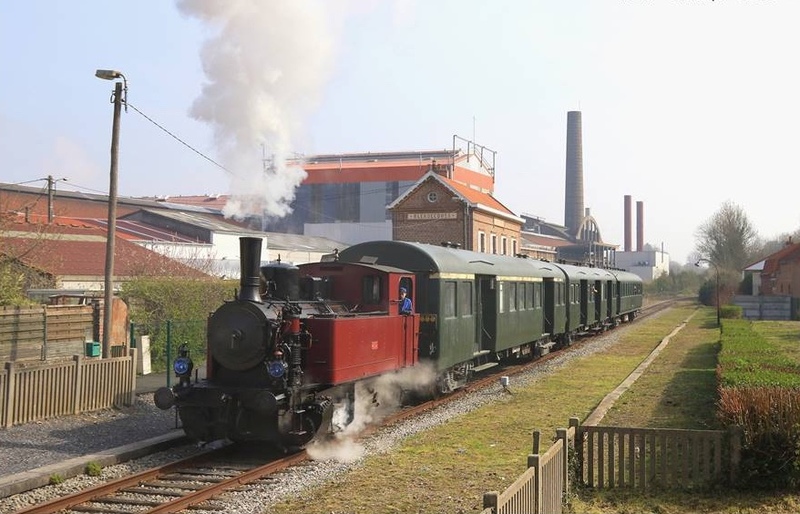 CFTSA plan to run a railtour with X4719 from Amagne–Lucquy to Le Treport via Abbeville on the 19th May (provisional arr:11:20 depart:18:00), but as this is currently a strike day it is unclear if this will run. France's newest large station Montpellier Sud de France on the CNM - Contournement Nîmes - Montpellier (Nîmes by-pass) is due to open on July 7th of this year with a limited service of 8 trains (2 TGV, 2 Ouigo TGV, 4 intercités). Passengers will be able to travel to Paris-Lyon once a day at 06.44 with a stop at Valence in 3h 09m or by Ouigo at 16.15 to Marne La Vallée and Aéroport CDG2 (19.51). Intercite services between Marseille and Bordeaux will also call at 09.43, 12.51, 15.40, 18.56. The Ouigo from Paris CDG2 will arrive at 15.25 and the TGV from Paris Gare de Lyon will arrive at 22.18 (continuing to Béziers). The small number of trains is due to the delayed construction of a similar station for Nîmes to be located on the CNM, planned to open in 2020. No link to the bypass has been constructed from the original line between Nîmes and Montpellier St Roch. While SNCF claims savings of 20 minutes compared to current services to Montpellier St Roch, this does not take account of travelling the 6km into town. Passengers alighting at Montpellier Sud will have to wait until 2020 for the tram line to be extended to the new station from its current terminus, about 1.5 kms away. Photo below courtesy of SNCF Reseau. Calais Port line to be rebuilt. As part of a plan to improve the port facilities at Boulogne, Calais and Dunkirk, SNCF will begin public consultation this month on moderning the line between Calais Ville station and Calais docks. The €53 million project will cover rebuilding 4km of track and 3.6km of overhead catenary, and modernising nine road crossings. The line currently sees eight trains a week and plans are to increae traffic to 15 trains a day, mainly with intermodal traffic destined for the UK. Etrepagny - Pont de l'Arche modernised. The 37 km freight line between Etrepagny and Pont de l'Arche is undergoing a modernisation project that should assure its future for the next ten years. The €2.4million has seen track and sleepers replaced and signalling simplified and is co-financed by the Normandy Region, the State, SNCF Réseau, the Grand Port Maritime of Rouen and the Port of Le Havre. On Friday 13th April the line between Saintes and Royan re-opened after five months of closure to replace 24 km of track between Saintes and Saujon, the replacement of wooden sleepers with concrete between Saujon and Royan and a range of other repairs including sealing and replacement of railway bridge decks. The work has enabled the line speed to be restored to 120km/h. 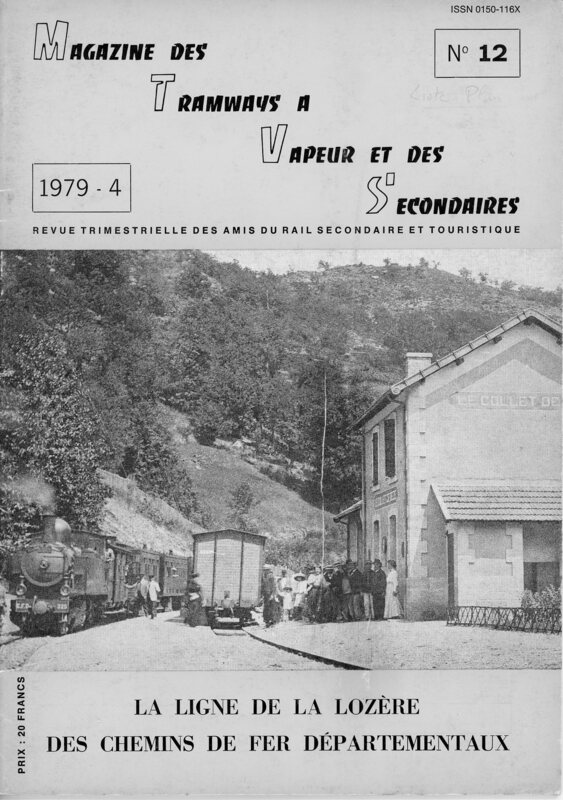 2018 MTVS issues - these are copies of the magazine, long since out of print, dealing largely with secondary railways in France. The latest issues uploaded are No. 12 “CdF Lozere” and No. HS 1978 “VF Alpes Maritimes”. 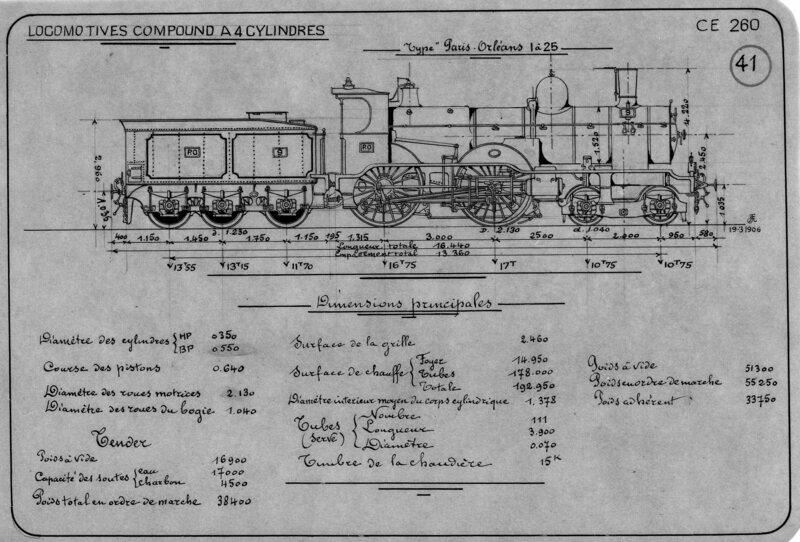 SLS Library drawings - these come from the library of the Stephenson Locomotive Society and are a combination of line drawings by a Belgian engineer Albert Jacquet and railway company drawings, mostly of locomotives used in the various French railway companies prior to the formation of the SNCF. This month drawings of the CdF de PO, CdF du Midi and Cdf de PLM have been uploaded. Brussels International Expo 1910 (Mk II) - French railway equipment displayed and described by J B Flamme (Adm. Traction Etat Belge); illustrations similar to existing gallery however more descriptive text. Anonymous Photographer on the Nord - Some 140 photographs of an unknown photographer who took pictures in the 1920’s & 1930’s, mostly at Boulogne, but some at Outreau, Calais & Dunkerque. The weekend of the 13th-15th April saw the CFTVA (Le chemin de fer touristique de la vallée de l'Aa) celebrate its 20th anniversary. As a prelude to the main event there was a parade of all of the Association's rolling stock on Friday 13th April, the highlight being the CFTVA's resident Polish 150Ty working a special cement train between Arques and Lumbres. Numerous workings were made over the 15km section of the old line linking Saint-Omer to Desvres and Hesdigneul, supplemented by events at Arques, Blendecques and Lumbres stations. Visiting locomotives included: the 060T Henschel of the Train des Mouettes, 040T 'Yvonne' of the Stoomcentrum of Maldegem (Belgium) and the replica of Marc Seguin. 60cm track was not forgotten with an 030T Orenstein & Koppel from the Chanteraines Railway in Paris. 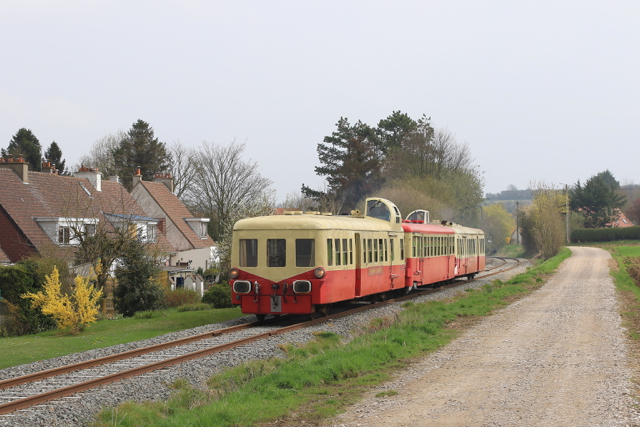 CFBS operations between Le Crotoy and St Valery began on the 30th March with services operating over the newly rebuilt section between Le Crotoy and Noyelles. Turning back the clock to the Society special in 2004. Cail 2-6-0T No.2 is pulling into the refuge siding to allow the service train to pass on the adjacent through line. Roles have been reversed with the refuge siding now the route of the through line, with the track bed on the left forming the passing loop. Photo Michael Bunn. In October 2010 the La Mure line was cut by a massive landslide. The cost of clearing the site and rebuilding the trackbed and repairing the tunnels is prohibitive. The local authorities now plan to re-open the line on the upper section above the landslide, and further details are expected shortly. The preserved section of the former Blanc-Agent railway is located between Luçay-le-Mâle and Argy with headquarters at the village of Ecueillé. The tourist trains operate on Sundays and Wednesdays. In 2018, SABA has announced that it will start a new service on Sundays from Ecueillé to Valençay with a stop at Luçay. The railcar will depart from Ecueillé at 11.15 and arrive at Valençay et 12.20. There will be a round trip Valençay - Luçay - Valençay between 15.30 and 16.30. Return to Ecueillé will be at 17.30, arrival at 18.30. This timetable will apply on Sundays in July - Sept (subject to authorisations). The first trip may be on June 17th (again subject to receiving the green light from the Prefet). Consult the web site via this link. This new development follows work in 2017 to renovate the 10 km of track between Luçay and Valençay and reactivation of level crossings. This section has been closed since October 2009. This tourist line in the Jura is the highest steam railway in France. It starts at Les Hôpitaux-Neufs (991m). The line descends the valley through pine forests towards Pontarlier, alongside the N 57. It is currently open for 8 km with a extension of 2 km under construction. The line was created through the vision and investment of a local public works contractor, Mr Louis Poix (Honorary President of UNECTO, after ten years as President), whose objective is to re-open the former international railway line from Pontarlier to Vallorbe(CH). This line was cut in 1940 at the tunnel of Jougne. The line in France was closed in 1969 and re-opened partially by CONIFER from 1994. During the last 25 years, the tourist line in the High Jura has become a popular destination with 30,000 visitors a year. Gradually, the line approaches the village of La Cluse-et-Mijoux under the Chateau de Joux. From this point, the last 5 km to Pontarlier station are already connected by rail. This summer, CONIFER will organise a festival in the forest at its current terminus, July 21st/22nd to celebrate 25 years of development. On this festive occasion, Louis Poix will present the fully restored 150 Y, a giant steam engine that will enter service on the line. It is the same type as that illustrated above in the article about CFT de l'Aa. 1. The 3 day circuit of the Massif Central operated by Autorail-Limousin is now fully booked. The two X 2800 railcars will pass Lioran on Sunday July 29th. 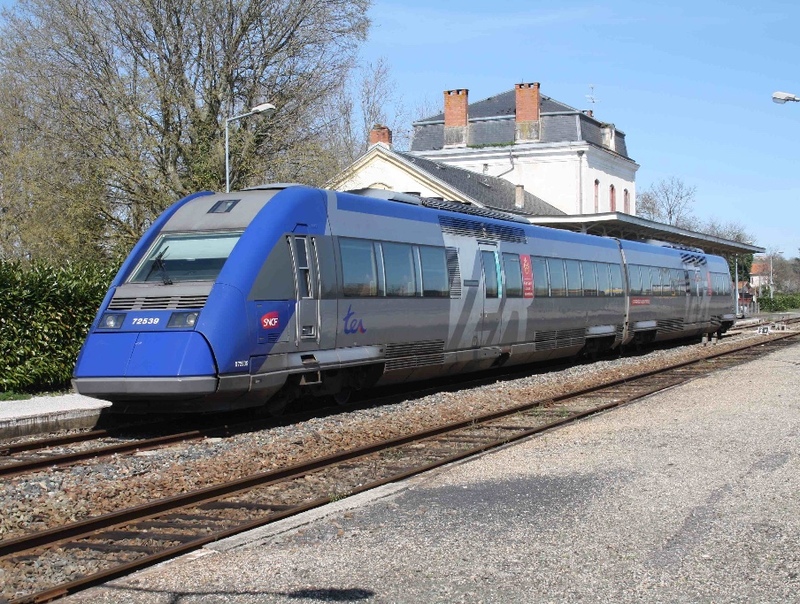 3.The special trains between Aurillac and St Flour during the week end by X 2403 remain scheduled and it is now planned that ABFC (Dijon) will operate a week end tour with Picasso X 4039 to Clermont Ferrand and Aurillac. The Picasso will operate with X 2403 in "double traction". These tours have not yet been opened for reservations. 4. The Train Historique de Toulouse will operate a special train (diesel hauled) to Aurillac and Lioran on Sat 28th July. 6. 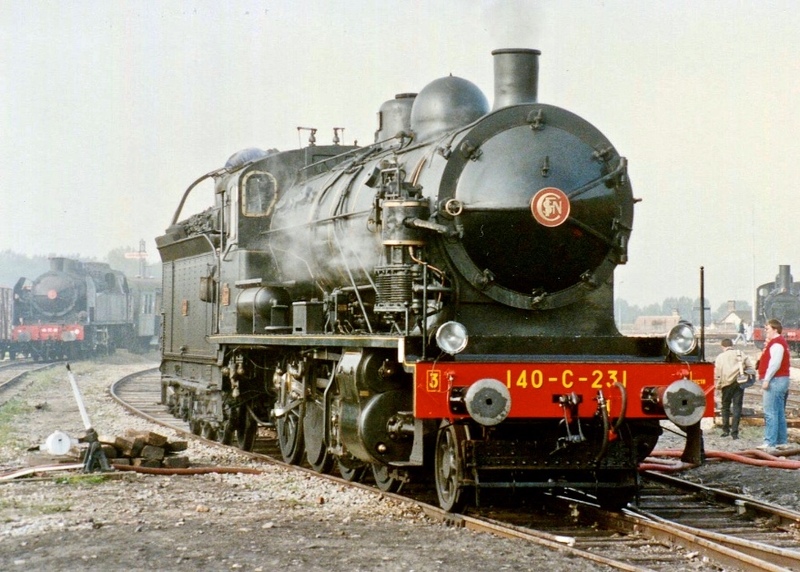 Regarding a possible special train from Clermont Ferrand organised by the association 141 R 420 there is no communication at present about that. This loco has been based at AJECTA, Longueville since October 1972. Originally built by North British at Glasgow in 1916, No 231 was retired in 1968 and later purchased by AJECTA. The loco has received several major overhauls since the 1970's. Last summer, a new boiler was delivered and the loco has been re-assembled during the last 9 months. On April 7th, 2018, No 231 emerged from the rotonde and was coupled to its tender. A successful steam test resulted in the safety valve lifting at 12.9 bar. An important stage in returning 231 to service ! In 2017, CFTV at Saint Quentin were pleased with their newly restored 140 C 314, in service after 11 years of hard work. But early in 2018, bad news ! A test run revealed big problems with the boiler and firebox. An axle has to be replaced on the tender. So it is back to the shed and the loco has to be disassembled again to analyse the problem with the boiler and determine the work to be done and the cost. The association has several Diesel engines available to haul the Sunday trains so revenues will not be affected. The reported agreement with SNCF to use a platform at Saint Quentin station is in fact a mirage, the national railway operator refuses to agree in advance to use of the platform. Although for many years, CFTV used the platform without incident. It is particularly frustrating for CFTV because their alternative departure platform by the depot is difficult to find for non-residents of the town and impossible for those without a motor vehicle. The Tourist Office has asked the association to arrange for a motor coach connection from the station to the CFTV depot ! © Peter Lovell & Graham Skinner. The French Railways Society 2018. Thanks to Georges Turpin, D Michel Costes, Christophe Masse, Michael Bunn and Bram van der Velden. Photos by authors unless credited.